Imagine that inside of each person who is struggling with drug and/or alcohol issues, there is a conflict between a voice that wants to keep drinking/using, and another voice that wants to be free of the drug and lead a better life. We abbreviate these voices as the “A” (the addict self) and the “S” (the sober self). That is not only an imaginary situation, it is a common experience for people who have got into addictive substances deeper than they expected. When two or more people get together who have this inner conflict, two outcomes are possible. Too often, the “A” in one reaches out and connects with the “A” in the other. “Let me buy you a drink!” “Sure, and I’ll get the next one.” They set up a feedback loop that reinforces the “A” in both of them and suppresses the “S.” This is a vicious cycle with harmful consequences ultimately leading to premature death. After each meeting, the “S” in each person is stronger than before. At some point, the person experiences a transformation. The “S” grows stronger than the “A” and rises to the top. Sobriety stops being an uphill battle and becomes almost second nature. So long as people avoid putting alcohol/drugs into their body, they can realize whatever potential lies within them and live full, productive lives. The LifeRing brochure, “LifeRing in a Nutshell” contains further illustrations. 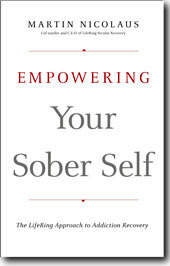 You can find much more detailed and in-depth explanations in the popular book Empowering Your Sober Self, and in the LifeRing convenor’s handbook, “How Was Your Week?“, both available in the LifeRing bookstore. The main thing to remember is that the LifeRing process is strength-based; it works by positive reinforcement of qualities that you already have. About to check out my first meeting to help with obtaining abstinence from alcohol. I am not new to recovery and have put together time successfully in the past with 12 Step programs. I have a question regarding the medical use of Marijuana. I have found it the best relief to some of the problems I suffer from (ie anxiety, depression and PTSD) and has been advised that it is an appropriate solution by Psychiatrist. Is this something that is acceptable and will it cause problems with other Life Ringer’s ? Medical marijuana presents a dilemma for LifeRing. We have no problem with the use of “medically assisted” recovery — drugs such as methadone to replace heroin. We oppose the use of Marijuana for recreational purposes; to us, getting high from pot is not much different than getting high from beer. So we support the use of medical marijuana when it’s legitimately prescribed by a doctor, just as we have no problem with opiate pain killers legitimately used under medical supervision. The word “legitimately” is used because, in California at least, pot prescriptions can be easily acquired from doctors who make their living selling prescriptions to virtually anyone who pays. In a situation such as you describe, many LifeRing convenors would leave it up to you and your doctor (presumably fully informed about your addiction history) to decide. But it might well be suggested that it isn’t an appropriate topic to bring up in a group situation. Many people trying to get and stay sober don’t want to hear of someone else who “gets” to use drugs. The above is my opinion only. LifeRing doesn’t have a clear policy because the problem is so murky. It took what it took and the time that it took, for me to get around the corner on this. I also had to do some “de-programming” from the past (from parts of a past program that didn’t work and actually worked against my recovering again). I found that when I kept trying and didn’t give up, that one day, things clicked. It’s working for me! Powerlessness & disempowerment + labeling from ‘the other program’ worked against me.